After writing this post I feel I should preface it with a disclaimer. 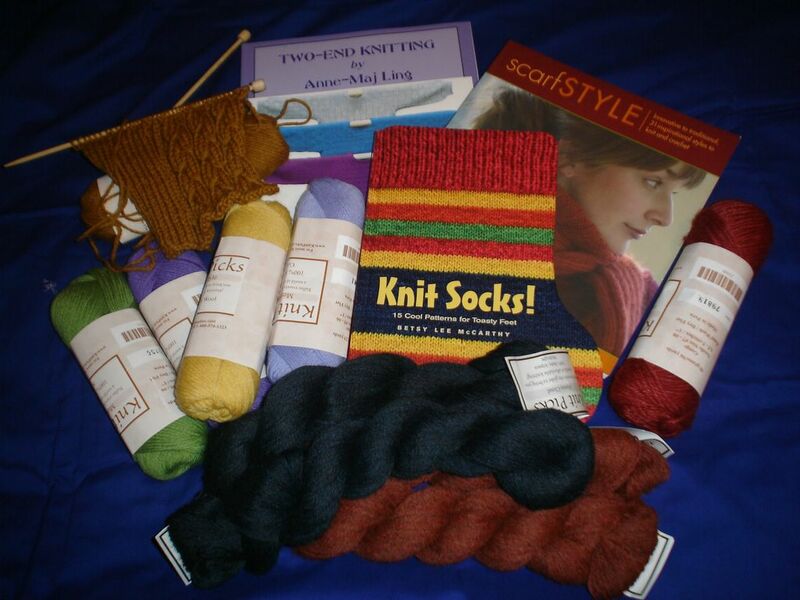 I am in no way affiliated with KnitPicks. I am merely a very satisfied customer. I love their products and the way they market them. 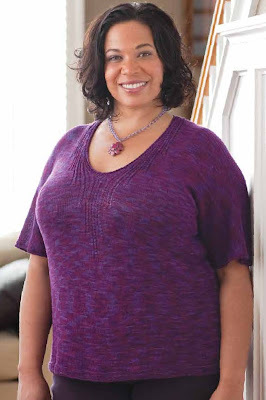 I have been drooling over the latest Knitpicks catalog for a while now. I finally whittled my list of "must haves" down to an (almost) affordable length and placed an order. My package arrived in record speed. I love this resource. Of the three books I got I love Scarf Style the most. There are several things in there that I dream about making. We'll see if any of them ever make it to the needles because my list of things I want to knit is longer than I could expect to make in three lifetimes. I suspect you know what I'm talking about! I've seen a couple of KAL's from this book so I think lots of people have liked it. My least favorite book was Two Ended Knitting. I learn best from books. I can take my time to let it click in my head. I've learned lots of craft techniques from books. I thought the instructions in this book were not very clear. To be fair I'll have to read through it again with yarn and needles and try to work through the instructions but I think it's going to be frustrating. I won't be able to try it until after Easter but if I change my mind about this book I will definitely let you know. The Knit Socks! book is fun and has cute patterns. There are several socks that I like in this book. 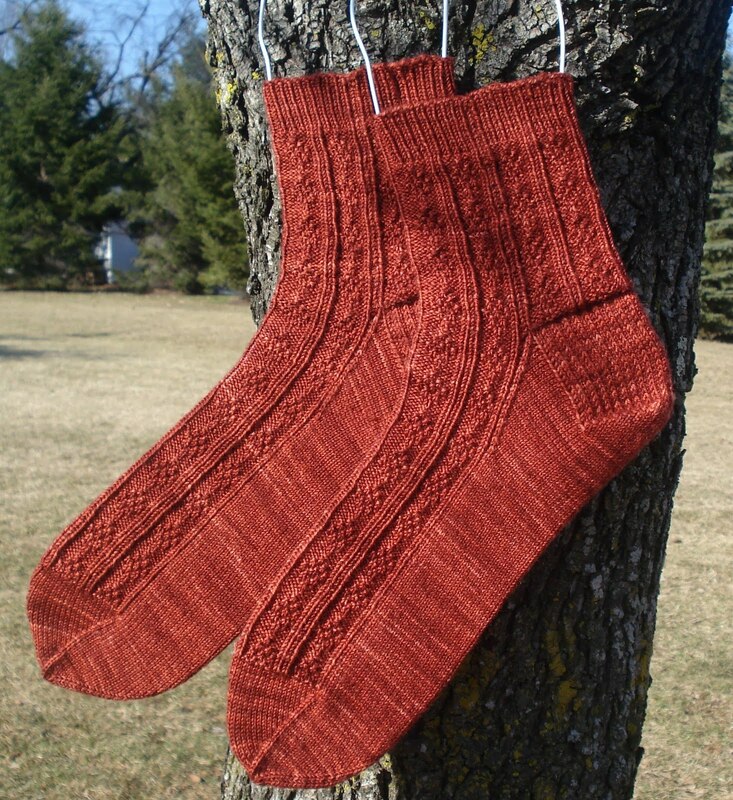 When I knit socks I tend to make things up as I go based on the yarn I'm using and the intended recipient. I'll use this book more as eye candy and as a source for inspiration and ideas than actual patterns. Speaking of socks... I've been reading with great interest all the excitement about sockapolooza. I wish I started blogging early enough to have participated in sockapolooza. I was very happy to read on Alison's blog that she's doing another round. I'm excitedly waiting for signup to open. Anyway, back to the KnitPicks order. The yarns I got are all wonderful. The swatch on the needle up in the left corner is Wool of the Andes in color wheat. Yes, that's another swatch for the Braids Cardigan I've been talking about incessantly. I started this swatch before I found the perfect yarn in my stash. I'll eventually finish the swatch anyway. At $1.79 per 50g I had to try this yarn. It is nice. I'd use it for lots of things like mittens, hats and sweaters. 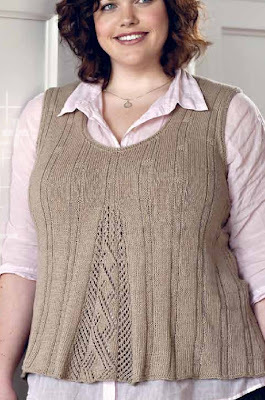 I don't think I would wear it right next to my skin but it is definitely soft enough for me for a pullover or cardigan that would be worn over a t-shirt or blouse. The four skeins grouped together (green, medium purple, yellow and light purple) are all Merino Style. This 100% merino yarn is soft enough to wear right next to my skin. I bought these colors to make a hat and mitten set for K. Her favorite color is purple. I picked the other two colors because I was looking forward to spring! I'll use all four colors and find some kind of faire isle patterning for the set. The deadline for this project isn't until next winter but the smallness of these projects makes them good candidates for summer knitting while waiting for swimming lessons to be finished. Next, there are four skeins of Alpaca Cloud. This laceweight yarn is so soft. It has to be touched. I got two skeins each of colors Midnight and Autumn. This is the yarn for which I had the hardest time choosing colors. I couldn't make up my mind because I love them all. It's been a while since I did any lace knitting. The brick colored yarn on the right is Andean Silk in barn red. This alpaca/silk/merino blend yarn feels so soft. I don't know what I'll do with this skein. I'm sure I'll find something to do even if it is just a large swatch in some interesting stitch pattern I find. I bought it because I wanted to feel it and see how it knits. Okay, commercial over. I really have to get busy and finish A's capelet so I have some finished projects to post. K's capelet is knit and steam blocked. I bought the buttons but have yet to sew them on. When both capelets are finished I'll post a picture. I have to get my bippy moving because these are to be worn on Easter morning! Wow, so many goodies! I love Scarf Style (I'm in the KAL) and Knit Socks!, although as an experienced sock knitter you'll find that Knit Socks! has very weird and overly-detailed instructions. So yeah, best used for inspiration, perhaps. KnitPicks is so great, I've bought their Wool of the Andes, Merino Style, Alapaca Cloud, Andean Silk, Elegance... and I've also bought book and notions from them. I just can't get enough! They are quickly starting to rival elann as my favorites :). I'm glad you're enjoying them, too!